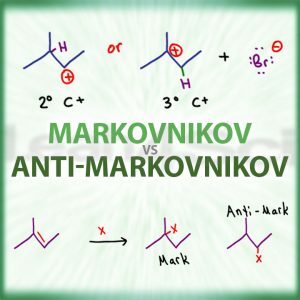 Markovnikov’s Rule is a very important pattern to both understand and recognize when studying alkene addition reactions. What is Markovnikov’s rule all about and how does this impact regioselectivity in electrophilic addition reactions? Mark refers to Markovnikov’s Rule while Anti-Mark refers to anti-Markovnikov addition. Syn and anti addition refer to which face of the pi bond BOTH groups will add. When both atoms/groups add to the same face it’s considered syn addition. When they add to opposite faces it’s considered anti addition. The difference between the two is determined by which atom the group added to (Mark vs Anti-Mark) or to which SIDE it adds (syn vs anti). Markovnikov and Anti-Markovnikov reactions are examples of regioselective reactions. These reactions are very specific about which atoms are added onto the molecule. So what is Markovnikov’s Rule? Markovnikov discovered that in the hydrohalogenation reaction with an asymmetric alkene, the halogen preferred the more substituted carbon atom. His observation led us to understand more about the nature of alkene addition reactions allowing us to apply this knowledge as a broad rule. Method 1: The nucleophile adds to the more substituted carbon. This rule is simple, the nucleophile will add to the more substituted pi-bound carbon. This leaves hydrogen to add to the less substituted carbon. Method 2: Hydrogen goes to the less substituted carbon. This trick looks at the reaction from the hydrogen atom perspective. In an alkene addition reaction, the hydrogen will add to the less substituted carbon so that the nucleophile can attack the more substituted carbon. Of the 2 pi-bound carbon atoms, the atom that starts out with more hydrogen atoms will gain yet another H in this reaction. All of these mnemonics are great for memorizing the reaction. But how will this help you recognize when a reaction does NOT follow Markovnikov’s rule? And what if there are no hydrogen atoms involved in this reaction? Which group qualifies as the Markovnikov addition? If you understand the concepts you’ll have a much easier time recognizing what’s going on. While Markovnikov observed halogen reactions, we need to understand the underlying cause LEADING TO this reaction pattern. WHY do the halogens add to the more substituted carbon atom? The answer is, it’s not about the halogen at all! It’s not even about the hydrogen! It’s all about the reaction intermediate. In organic chemistry mechanisms, the more stable a reaction intermediate, the faster it will form, and the more likely you’ll get products. Stable intermediates result in high yield products. Unstable intermediates result in low yield products. Very unstable intermediates result in no reaction. Therefore, the less stable the intermediate, the slower or less likely it will form a product. Can you blame the reaction? If you knew YOU had to do something unfavorable, would you do it? For example, if your great Aunt asked you to come over and clean her attic… would you be in a hurry to do it? Knowing that she has a centuries worth of junk piled in there? Most people avoid doing things they don’t want to do or at least delay doing them as long as possible. These reaction intermediates are no different. So, what intermediate are we referring to? While Carbocations are not very stable they will form under certain conditions. The pi bonds sit in the middle of the molecule on a secondary and tertiary carbon atom. In the mechanism for this reaction, we see the pi bond nucleophile attacking a hydrogen atom. While the reaction starts out with addition of hydrogen, it’s actually NOT about the hydrogen atom. Think of adding H as a simple, yet, necessary step so that we can attract what’s really important. With hydrogen out of the way, we look to the halogen, which is currently floating around in solution with a full octet and formal charge of -1. Since the pi bond sits on 2 carbon atoms, we have the option of adding hydrogen to the right or left of the secondary or tertiary carbon atom. Hydrogen doesn’t care. Look at what happens to the OTHER carbon atom. Having lost a pi bond and gotten nothing in return, it now has a formal charge of +1. You can find this using the shortcut taught in this tutorial. If you review the carbocation stability tutorial, you’ll understand that the tertiary carbocation is much more stable compared to the secondary carbocation. But, due to the stability of the more substituted carbocation, the tertiary carbocation will form faster and in greater amounts. When the negative halide finally makes it back to the carbon chain, it discovers a positive carbon atom. Halogens don’t care one bit about what the carbon substitution looks like. The carbon addition location has already been determined by the formation of the stable carbocation intermediate. The only thing the negative halogen cares about is attacking a positive carbon. If that carbon is secondary, it will attack at the secondary position. If the carbon is tertiary, it will attack at the tertiary position. This is how we get the product. So what ultimately made the difference? The carbocation intermediate. If a reaction follows Markovnikov’s rule, the nucleophile will add to the more substituted carbon atom. then the nucleophile adds to the carbon that would have formed the most stable carbocation. This differs slightly from the rules above because it takes a carbocation rearrangement into account. 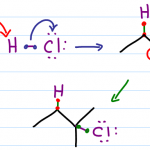 Did you forget a hydride shift for carbocation rearrangement? In short: The nucleophile will add to the carbon that can form the most stable carbocation intermediate. Will this reaction undergo a carbocation intermediate? Yes or no? If yes, which carbon would be the most stable carbocation? That’s where you add the nucleophile. This is why it’s so important to understand what’s happening in this reaction. Anti-Markovnikov is not about forming a carbocation in the less stable position. This reaction has absolutely NOTHING to do with a carbocation. If there’s no carbocation intermediate, then what determines where to add the incoming groups? Let’s take a look at the other driving factors. Which aspect of the mechanism will force the molecule to react one way or the other? 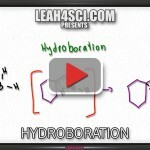 Take Hydroboration-Oxidation. This is likely the first reaction that comes to mind when you think anti-Markovnikov. Why does the OH add to the less substituted carbon? Think about the mechanism explained in this video. The bulky trialkylborane cannot be attached to the substituted carbon. It needs ‘space’ at the end of the molecule, forcing hydrogen to the more substituted position. Alcohol replacing the boron bond is simply a means of finishing off the reaction. OH replaces the boron position. As a result, there is NO carbocation formation or a partial positive charge any step of the way. 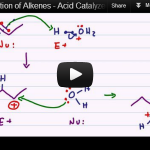 Let’s review the alkene reaction regioselectivity and then break them down in more detail. given their lack of carbocation intermediate or the fact that we’re adding the same thing to both carbons of the former pi bond. So we understand how Markovnikov’s rule is affected by carbocation intermediates and we know which reactions follow Markovnikov addition or anti-Markovnikov addition. But how are these reactions correlated? Let’s break down Mark and Anti-Mark in theses individual reactions to ensure this concept is crystal clear. This is the very reaction Markovnikov observed. 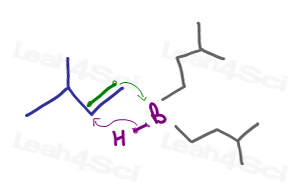 In this reaction, the pi bond grabs the H atom kicking off a negative halide. In asymmetric alkenes a more substituted carbocation will form. If a nearby carbon atom is more substituted you may even observe a carbocation rearrangement in the form of a hydride or alkyl shift. Halogen returns to attack the carbocation adding to that position. When you look at your starting alkene, FIRST identify the more substituted carbon atom, NEXT determine if a shift can occur and lastly add the halogen accordingly. This reaction can happen in water forming a halohydrin. If dissolved in alcohol, the product will be a haloether, Ether + halogen! This reaction is similar to halogenation up to the bridged halogen formation. Since the negative halide is surrounded or ‘blocked’ by the solution, a solvent molecule attacks to open the bridge. The halonium bridged intermediate does not form a carbocation, so how can this follow Markovnikov’s rule? Review the mechanism and you’ll see that despite being neutral, each carbon carries a slight positive charge. The more substituted carbon can handle a greater amount of positivity, attracting the incoming water or alcohol molecule. When looking for Markovnikov’s rule in this case it’s the alcohol or ether group that adds to the more substituted. The halogen is similar to hydrogen in that it adds to the less substituted carbon atom having added first. This is one of the three hydration reactions you’ll study for alkene reactions, and the only one that undergoes a carbocation intermediate. Much like hydrohalogenation, the carbocation intermediate will form on the most substituted carbon. Water as the nucleophile will attack the carbocation forming on the most substituted carbon atom. This is the second hydration reaction of alkenes. While this reaction does NOT undergo a carbocation intermediate, it still follows Markovnikov’s rule. How? Like the halonium intermediate in halohydrin formation, we get a bridged intermediate with mercury carrying a positive charge. Like the bromonium and chloronium, the positive mercurinium ion will pull on the bonds between itself and carbon making them partially positive as a result. The more substituted the carbon atom, the more partial positive charge it will carry. I like to think of mercury as a ‘carbocation babysitter’ because it allows a partial carbocation to form but DOES NOT allow a carbocation rearrangement. The incoming water molecule for oxymercuration or alcohol molecule for alkoxymercuration will attack and add to the more partially positive carbon atom. This is the third and final alkene hydration reaction. And the only one that adds anti-markovnikov. 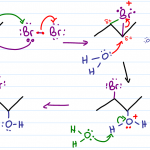 As explained above, this regioselectivity is due to the bul ky boron group adding in the first step and then forming hydrogen to add to the more substituted carbon of the pi bond. If you can remember the bulk boron group you’ll have no trouble predicting this reaction as anti-Markovnikov. This reaction is often referred to as LIGHT halogenation, where the ‘standard’ halogenation reaction is the ‘dark’ reaction. Radical stability follows the same pattern as carbocation stability! The more substituted radical is more stable. If that’s the case, why does this reaction occur in an anti-Markovnikov fashion? It’s about the sequence of events. In halogenation the hydrogen adds first and halide attacks the carbocation. In radical halogenation, the halogen adds first to form the radical intermediate. This radical forms on the more substituted carbon atom AND THEN attacks a hydrogen atom. This adds IT to the more substituted carbon atom. There is No carbocation intermediate or alternate sequence of addition events. Markovnikov’s rule is less about memorizing what goes where and more about understanding that if there’s a carbocation intermediate it will form on the most substituted carbon atom. Any nucleophile in solution will then attack the positive carbon no matter where it is. Reactions that show anti-Markovnikov regioselectivity have another driving factor and do NOT show a carbocation intermediate.